Sometimes when it’s Friday (let’s be real, it’s not every week), I’ll share five photos that I’ve taken. This is today’s batch, and the theme is Omaha Storm Chasers players. Obviously I don’t have current pictures of them, so you’ll have to come to Werner Park to see them in their new uniforms and new park! 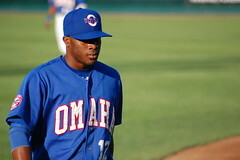 Due to inclement weather, the Omaha Storm Chasers are rescheduling their home opener at Werner Park to tomorrow, Saturday, April 16, 2011 at 7:05 p.m. Fans holding tickets for tonight’s game can exchange them for tomorrow night or any future game (excluding July 3 and July 15) by taking their tickets to the Werner Park ticket office. Ticket office hours will be extended today until 8 p.m. to accommodate ticket holders and will open tomorrow morning at 9 a.m.
Events planned for Friday will be combined with the special events scheduled for Saturday. A news conference will be held today at 3 p.m. at Werner Park at which time the Storm Chasers management will provide media with a detailed schedule of Saturday’s events. 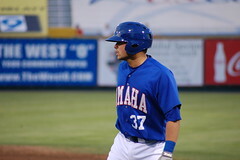 The Storm Chasers and Sounds will make up Friday’s game as a doubleheader on Sunday, April 17, 2011 beginning at 2:05 p.m., the regularly scheduled time. Now, on to the pictures, and I’ll see you tomorrow! Moose sez: WHATCHOO LOOKIN' AT? 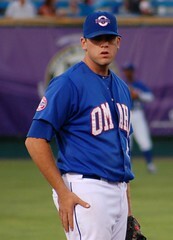 Greg Holland. 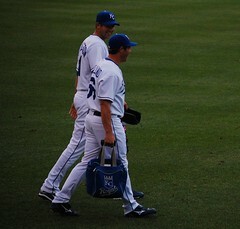 This was his first day in the Bigs; that's why he's carrying the ball bag. Manny Pina. You're welcome, ladies. David Lough reminds us of the importance of hydration. Yes, the weather is crappy right now. But as far as anyone knows, there will still be baseball and festivities at Werner Park tonight. UPDATE: It is so crappy, the game is off. We’ll do everything tomorrow instead. I will be there. This is what my uniform looks like, so you know how to find me. Freebies include a Werner Park welcome mat, which I very much covet, and a commemorative lapel pin. Now, can it be time for the ballgame already? Go Storm Chasers!